We live in such times where the same air that sustains life holds agents of death and disease as well, and the concentrations of the latter are increasing. Ambient air pollution is a major threat to the health and wellbeing of the global population. According to World Health Organization (WHO), ambient air pollution was responsible for 42 lakh deaths globally in the year 2016. Particulate Matter of size 2.5 µm or less (PM2.5), ozone gas and, nitrogen oxides (NOX) are major sources of this air pollution-related death and disease burden. Smaller size PM poses greatest health problems as these tiny particles can penetrate deep in the lungs and travel farther via bloodstream to other tissues in the body. Exposure to PM pollution can cause asthma, reduction in heartbeat, diminished lung function and can lead to premature death in people with heart or lung disease. Even transient exposure to ozone can cause chest pain, irritation of the throat, coughing and wheezing, while long term exposure can be responsible for inflammation of the airways, lung damage, and lead to premature death in people with heart or lung disease. Short-term exposure to NOX, a group of chemicals, can lead to headache, abdominal pain, coughing and irritation of the eyes and skin, while long term exposure to NOX can cause asthma and infection of the lower respiratory tract. Exposure to very high levels of NOX can impair female fertility, harm the developing foetus, cause genetic mutations and even death. Various anthropogenic emission sectors like transportation, energy, industrial, and residential and commercial contribute to elevated levels of these pollutants in ambient air. These sectors differentially contribute to air pollution depending on the geographical location and population density. 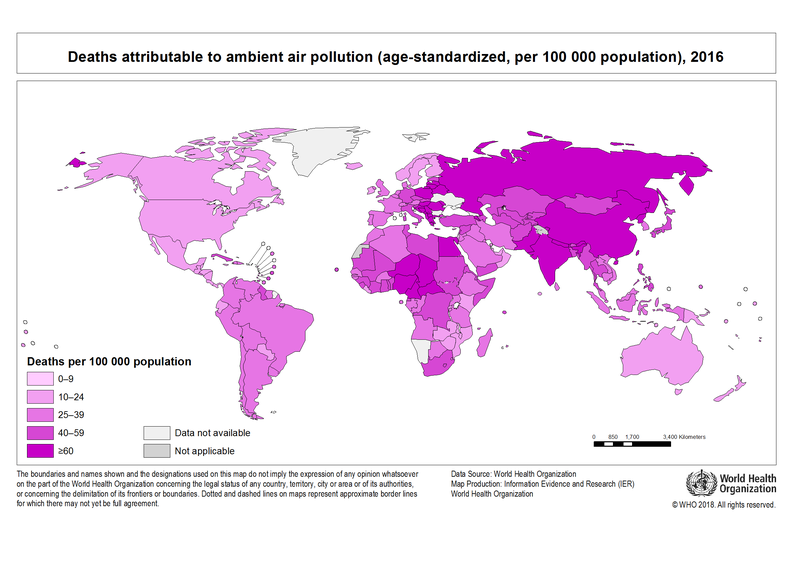 According to this study titled “The Impact of Individual Anthropogenic Emissions Sectors on the Global Burden of Human Mortality due to Ambient Air Pollution”, published in 2016, knowledge of the contribution of different sectors to the global death and disease burden and their relative relevance in a region-wise manner can help prioritize international and national strategies towards pollution abatement. A more recent report published by the International Council on Clean Transportation (ICCT), which primarily focuses on the transport sector contribution to the air pollution linked death burden, stresses on the need to accelerate emission reduction reforms in the transportation sector at national and sub-national level to reduce ambient air pollution and its global health burden. Combining the results of both studies, it is clear that globally, transport sector, and residential and commercial sectors are the largest causes of air pollution-related deaths. However, in regions like the Indian subcontinent, East and South-east Asia, residential and commercial emissions, industry emissions, and energy sector emissions (in that order) are the causes of air pollution-related deaths. The 2016 study estimated that land transportation had the greatest global impact and the greatest regional impact in Europe, Former Soviet Union (FSU), Middle East and the Americas (North and South). This is because emissions from land transportation can greatly influence ozone concentrations. The same study revealed that the energy sector and the residential and commercial sector strongly influenced air pollution linked mortality in India. The ICCT report mentions that the expected gains from emission reductions were far outweighed by the growth in transportation activity resulting in an increase in transportation linked mortality in India and China. The ICCT report specifically focuses on the transportation sector and finds that about half of all deaths by ambient air pollution from the transportation sector are caused by diesel. It is worth noting at this juncture that regions like the Indian subcontinent are densely populated. This increases the odds of being exposed to emissions from on-road vehicles (land transport sector) or emissions from the many coal-fired power plants, or both, leading to heightened risk of mortality and morbidity for people. That there could be a link between population density and mortality risk from the energy sector emissions is reflected in the findings of the 2016 study which estimates energy sector has the highest impact on air pollution linked mortality in India, along with the residential and commercial sector. The same study reveals that energy sector had the greatest impact with respect to ozone linked mortality, while the residential and commercial sector had the greatest impact with respect to PM2.5 linked mortality. Smoke from chulhas in households is the major killer in rural India; while Indian coal power plants, which are the unhealthiest in the world, are responsible for close to 1,15,000 premature deaths every year. Through failures in timely implementation of the revised emission standards for power plants and the draft National Energy Policy (chapter 5) mentioning that India’s coal-fired capacity is expected to rise from 192 GW in June 2017 to anywhere between 330 to 441 GW by the year 2040, emerges a sorry state of affairs when it comes aggressively tackling the menace of ambient air pollution. Concomitantly, between the year 2006 and 2017, coal mining in India has increased from 198 tonnes of oil equivalent (TOE) to 294 TOE. This has further aggravated the ambient air pollution, lead to the destruction of forest ecosystems, and displacement of indigenous communities, as delineated in a report on the tribal people of Singrauli in Uttar Pradesh. All this is happening even while the Central Pollution Control Board (CPCB) has classified Singrauli as a critically polluted industrial area and the NITI Aayog has put the district in the list of the most backward districts in India. While CPCB has laid down rules for environmental monitoring in critically polluted areas, the situation in Singrauli only points towards continuous degradation of the region’s resources. If the coal mining and coal-fired power plants had indeed brought development and prosperity to the region, it does not reflect in Singrauli’s place among the most backward districts of India. In the neighbouring state of Jharkhand, there are reports of alleged land grab attempts by an Indian business group to set up a power plant. Emissions from coal-fired power plants are known to contain 84 of the 187 hazardous air pollutants, as identified by the United States Environmental Protection Agency (U.S. EPA). This study published in Nature, says that 66 percent of the known coal reserves in India and China have to be left untouched and in the ground, if the international community intends to limit the rise in global temperature to less than 2 °C. For countries like India, it will be a dual advantage in terms of preventing avoidable deaths due to ambient air pollution and contributing towards achieving climate goals to limit global warming.